HP officially does not support importing qcp files for the projects whose size is bigger than 4GB and at the same time size of the qcp file must be smaller than 2GB. You probably going to get "Server disconnected while performing ImportProject action" error message while importing the project from siteadmin panel. Detailed information can be found in this document (KM1025768). There is a workaround solution for the projects whose database files is bigger than 2GB. I'll describe the walkthrough. First of all you have to have an application that handles zip files (like 7zip or Winzip). Backup your original qcp file to somewhere else. Change the extension of the project's backup file to zip extension (let's call this backup.zip). Extract backup.zip to backup folder. In the backup folder cut-paste the ProjRep (let's call this folder backup_rep) folder to somewhere else. ProjRep folder is a very huge file (in my case bigger than 6GB). There will be only xml files and TABLES folder in the backup folder (about 40MB - 50MB in my case). From the siteadmin panel create an empty dummy project. 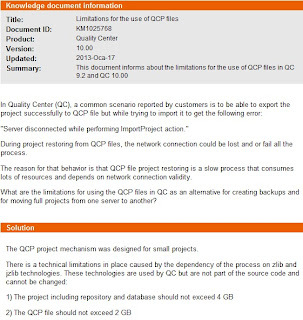 And export this project to dummy.qcp (To learn about export process you can check here). Change the extension of dummy.qcp to zip. Extract the dummy.zip to dummy folder. In the dummy folder you'll see ProjRep folder. Cut and paste this ProjRep folder into the backup folder. Zip the backup folder and then rename the backup.zip file to backup.qcp. Check the backup.qcp file size. It should be less than 2GB. 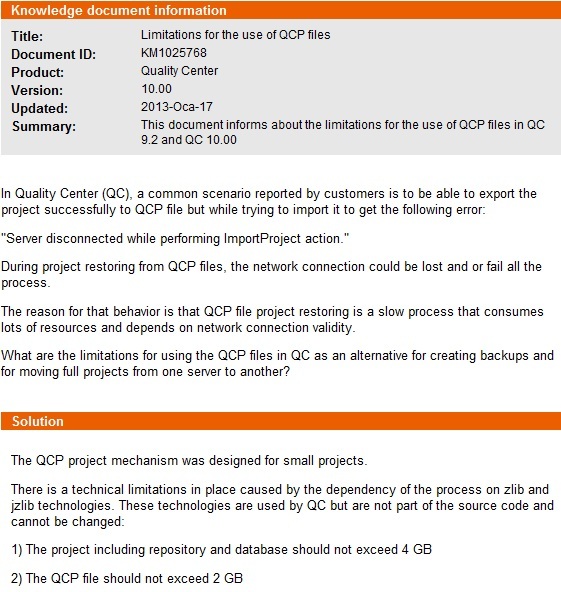 From the siteadmin create a project from a qcp file. And use backup.qcp while import process. Do not forget to uncheck "Activate project when restore completed". When the project creation completed go to the project directory via remote desktop connection. You can see the project directory from the Siteadmin Panel - Site Projects. Replace the ProjRep folder with the folder backup_rep (the folder in the step 4). Activate the project from the siteadmin.